Worked as a physician until 1894. In his first works, among them "Anatol (1894)", he investigated psychoanalysis. Around this time he had a passionate affair with the actress Adele Sandrock. Schnitzler wrote a number of plays in which he portrayed life in Vienna during the fin-de-siècle in a painfully accurate way. His "Reigen" (written in 1897 and pubished in 1900) was regarded as pornographic and several trials followed. In his novel "Der Weg ins Freie" ("The Road to Freedom") he attacks antisemitism. In 1903 he married Olga Gussman. Director Heinrich Schnitzler (1902-1982) is their son. Their daughter Lilly was born in 1909. She married the Italian officer Cappellini in 1927 but she committed suicide on 26 Jul 1928 in Venice. Olga's sister Elisabeth married the actor Albert Steinrück. Works: "Professor Bernhardi" (1912; forbidden by the Austrian censors); "Casanovas Heimfahrt" (1918); 'Traumnovelle' (1926). 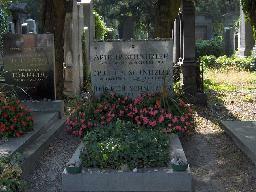 The grave of Arthur Schnitzler at the Zentralfriedhof, Vienna.